At Sherman Oaks Auto Repair in Sherman Oaks, CA, we are the top choice for wheel alignment in the area. 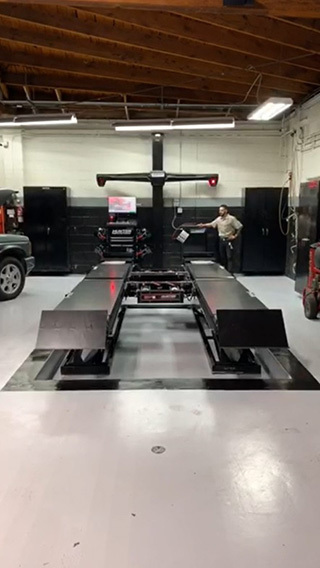 We are now equipped with a state-of-the-art Hunter Tire Alignment machine for accurate and professional wheel alignment services. Proper wheel alignment is important when it comes to your safety on the road and also protecting the integrity of your tires. Driving with tires that are out of alignment can dramatically decrease the life of your tires by causing excessive and uneven tire wear. As soon as you notice any of the symptoms above, bring your vehicle into our experts for a quick inspection and service. Tires can fall out of alignment by many different things that can happen every day, including driving over a pothole, hitting road debris or a curb, or driving fast over speed bumps. Our experts will correctly align your tires promptly and professionally. We will also inspect connecting parts and suspension components to rule out any other issues. For professional and quality Sherman Oaks wheel alignment services, stop by Sherman Oaks Auto Repair or give us a call today!